Archaeologists have uncovered a 1,500-year-old wine-pressing complex, which exceeds 100 square metres in area, in Israel among the ruins of an ancient Byzantine settlement. 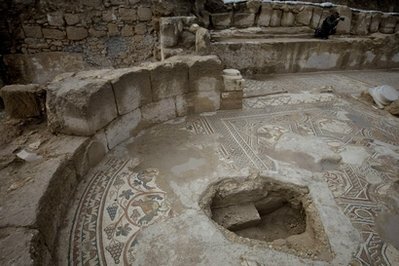 At the site near Hamei Yo’av, researchers found a ceramic lantern fashioned in the shape of a miniature church and carved with crosses, suggesting the ancient wine factory was owned by a Christian. The wine-making complex had compartments where the grapes were likely left to ferment after being delivered from the vineyard, the Israel Antiquities Authority (IAA) has said. At its centre was a large, sloped treading floor where the fruit was pressed, sending the juice flowing into settling and collecting vats. The archaeologists said they found a cavity that was probably used to turn grape waste into vinegar and low-grade “paupers’ wine”, LiveScience reported. “Three similar wine presses were found in the region close to the main road leading from Ashkelon, located along the coast, to Bet Guvrin which is in the Judean Shephelah. Ashkelon was a commercial city with a port through which wine from Israel was marketed to the entire Mediterranean Sea basin,” said Saar Ganor, the Ashkelon district archaeologist of the IAA.